Longtime advocate for crime victims, tenants’ rights and leader of the Chinatown Freemasons, Karlin Chan believed the lack of assistance Ruan received reminded him of the Kitty Genovese murder that happened 50 years ago in March. That murder was infamous because 38 bystanders watched as Genovese was stabbed and killed. The lack of assistance reminded Chan of the Genovese Syndrome, also known as the bystander effect. Chan believes that the viciousness of the attack pointed to a racial motivation. I agree that the attack had a racial component to it, but my sense is the ferocity of the attack shouldn’t be singled out as the primary racial factor. I believe Pugh’s decision to go after Ruan, though maybe not entirely conscious, was steeped in Asian stereotypes. Stereotypes that label all Asians as easy targets from early on. Just as Winston Moseley went after Genovese and other women because “they were easier and didn’t fight back”, I believe a similar presumption may have been made prior to Ruan’s death. Asian children are overwhelmingly bullied more than any other race. We’re not talking just by a small percentage, but by nearly 20% higher than other ethnicities according to 2011 study by the U.S. Justice and Education Department. More than half of Asian-Americans, between the ages of 12-18, reported being bullied in the classroom. 54% of Asian-American teens reported being bullied in the classroom. 31.3% of White teens reported being bullied in the classroom. 38.4% of Black teens reported experiencing bullying 34.3% of Hispanic teens have to contend with this type of harassment in the classroom. The safe assumption is that bullying begins to slow as bullies get older, presumably mature, and some go off to college. Still, those preconceived notions that made them choose to target Asians just don’t dissipate into the ether as one turns 22 or walks onto a campus. For those judgments and thoughts that stick, they continue to color our perception and reality; affecting not only our decisions, but influencing other’s too. If you’d like to make a donation to help support Ruan’s family, go here. 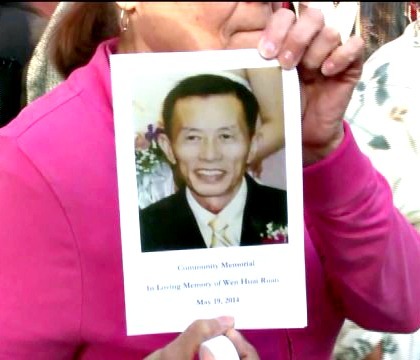 My thoughts on the “random” assault, death of 68-year old Chinese immigrant in Alphabet City Family to Hold Public Memorial Service for Wen Hui Ruan Are Asian immigrants being targeted for MTA subway attacks?